Ethical beauty retailer The Body Shop is proud to announce that British singer and global superstar Leona Lewis has become its new Brand Activist. Seven years after her triumph on The X Factor (UK), Leona has twenty million albums sold and a glittering collection of awards and award nominations, yet she remains grounded and true to her beliefs. An animal lover and longtime vegetarian, Leona is the perfect partner for The Body Shop and its unique vision of cruelty-free beauty. 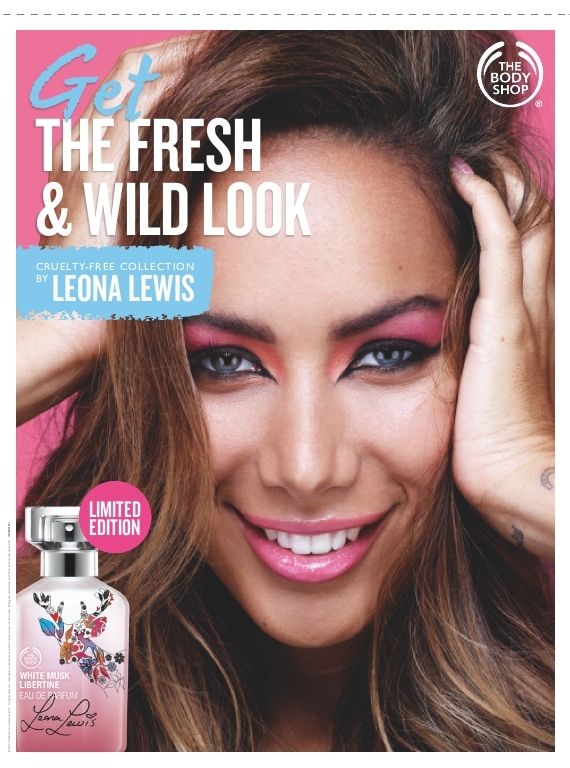 Leona has also put her name on an exclusive cruelty-free fragrance collection, the Limited Edition Collection by Leona Lewis. Featuring 100% vegetarian products, the Limited Edition Collection by Leona Lewis features quirky packaging with a floral deer motif, celebrating the fact that The Body Shop was one of the first beauty brands to use cruelty-free, man-made musk instead of musk derived from the musk deer. The Limited Edition Collection by Leona Lewis is available at selected stores in Egypt in the coming weeks. Tell me a little more about the new Limited Edition Collection by Leona Lewis? All The Body Shop® products are cruelty-free, and the Limited Edition Collection by Leona Lewis was created to raise awareness of cruelty-free beauty. It features trend-led makeup and a playful musk fragrance, all presented in super-stylish packaging with a pretty, floral deer motif. 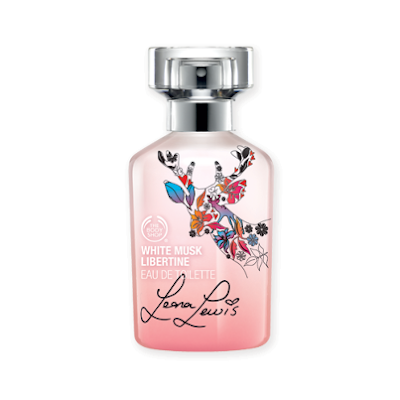 How involved were you in the making of the Limited Edition Collection by Leona Lewis? I worked with The Body Shop team to develop the collection and the pattern for the cruelty-free deer logo which is featured on the packaging, which I love! What was the inspiration for the deer logo featured on the packaging? Traditionally, musk fragrances were obtained from deer. The Body Shop was one of the first beauty retailers to use man-made musk in their classic White Musk fragrance. The logo celebrates the freedom of the deer and the cruelty-free ethos of The Body Shop. What is your favourite product in the Cruelty-Free collection? The whole collection is amazing and I adore them all. I'd say the White Musk Libertine is such a gorgeous fragrance and has a great 'cruelty- free' message around it, so it really stands out for me. Cruelty-free musk is a signature scent of The Body Shop and a must have for all us ladies! Happy, totes emosh, funny, creative and passionate. Note: “totes emosh” is English slang which means “totally emotional”. At the age of 6, I started theatre school and began singing lessons. What has been the most pivotal experience in your career to date? My tour in 2010 was pretty amazing. I learnt so much from performing to production and had a really great time. Work hard and then take time to do the things you love. I always make time to go riding or to the beach, spend time with my mates and just have a laugh. Where is your favourite place to wake up and why? I do love Wales as my family lives there. I love going at Christmas and waking up to snow, but being warm and cosy inside. My books and my note pad so I can draw and write. What is the funniest thing that has ever happened backstage at one of the shows? My aunty dragging Will Smith over to meet me and telling him he had to meet me as I am her niece and can sing well! I almost died of embarrassment, but so glad I got to meet him. I have been veggie since I was about 12. I call myself a vegetarian with vegan tendencies. I wouldn’t like to be an animal as I feel most are treated badly. What else are you currently working on and what do you have planned next? I’m writing lots at the moment and working on some personal projects. I’m also preparing for my tour this year, which I’m so excited about! What would you like to achieve professionally and personally? I see myself touring more, writing more and expanding more on my personal interests. I'd love to be involved in a film and musical production in a writing capacity. What is your first memory of The Body Shop? I was never able to walk past the shop without going inside! It always smelt so gorgeous, so I would go in and try all the products. My favourite was the White Musk® fragrance. What does The Body Shop mean to you? I’m very conscious of where the products that I use come from. The Body Shop sells amazing cruelty-free, ethically sourced products. Everything it creates has real “heart” inside and I love being a part of that. Why are you collaborating with The Body Shop? I’m passionate about beauty and I’m all about animal rights and Community Fair Trade. As a result, I’m really conscious of where the products that I use come from. The Body Shop sells cruelty-free, ethically sourced products containing amazing Community Fair Trade ingredients. Everything it creates has real soul – they call it “Beauty With Heart” – and I love being a part of that. The collaboration is a natural fit! What are your top ten favourite The Body Shop products and why? 1. White Musk® – It reminds me of my school days when I used to bathe in it! 2. Brazil Nut Beautifying Oil - It’s so hydrating and makes my skin soft without any stickiness. 3. Satsuma Soap - It just smells so divine! 4. Coconut Body Butter – This Body Butter is so rich and moisturising, it stops dry skin in its tracks. 5. Vitamin E Moisture Cream - My friend and I would smother Vitamin E Moisture Cream on ourselves when we were younger. I still can’t get enough of it today! 6. Brow and Lash Gel - For a natural lash look and neat brows, this is a must-have. 7. Strawberry Bath Gel - The scent is gorgeous, especially after a hard day on tour. 8. Rainforest Hair Butter- I'm constantly having my hair styled and Rainforest Hair Butter leaves my hair soft, manageable and shiny. 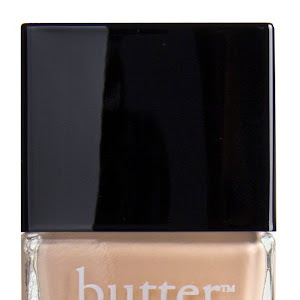 Is a beauty brand that is vegetarian important to you when choosing your beauty products? When I choose a beauty product, I always make sure it is 100% vegetarian and 100% cruelty-free. I wouldn’t feel beautiful using anything else. What does Beauty With Heart mean to you? To me, Beauty With Heart means that you can be sure that the beauty product you’re using has not hurt any person or animal in the process of being made. The power to choose Beauty With Heart is in every consumer’s hands; I don’t believe people would choose anything else if they knew they had a choice. How do your personal values compare with the five core values of The Body Shop? The five core values of The Body Shop should matter to everyone. I strongly believe in all of them. I adore Thandie Newton because she has such an effortless natural beauty. Her sense of style is so chic and elegant, she always looks amazing. 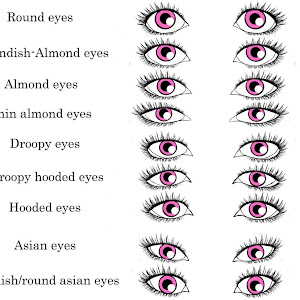 How would you describe your beauty/signature look? I'm always chopping and changing and love trying different things. I'd say simplicity is key though. How does your look differ when you go on stage/red carpet? I love a beautiful gown on stage, and luckily I've been fortunate to wear some amazing dresses. Day to day I'm more relaxed, although I do enjoy the odd night curled up on the sofa watching Eastenders in a Cavalli gown! Drink lots of water and juice. For me, having glowing, healthy skin is beautiful. Smother on the oil! Being mixed race I've grown up using lots of lotions like cocoa butter and oils that are very hydrating. It’s so good for your skin. What tips have you picked up from makeup artists? I've been lucky enough to work with some of the top makeup artists in the world and along the way I've learnt so much! My most useful tips are makeup looks relating to photo shoots and stage. Makeup changes so much in these lighting situations so you really have to cater to what the light reflects. You can look totally different in the dressing room to when you hit the stage because of the lighting. What’s your latest beauty obsession? It has to be my new Shimmer Palettes in the Limited Edition Collection because they work for day and night looks. You can go from glowing and natural to a bronze goddess! My electric tooth brush, coconut moisturiser and The Body Shop Beautifying Oils. I do love my mascara! Describe your daily beauty regime? Would you say your beauty routine is high or low maintenance, and why? I spend most time on my hair. It’s usually wild and crazy and some days I need to tame it, whereas other days I just let it be! I think I'm in the mid range of maintenance. Do you sing in the shower and, if so, what? Always, and it’s usually some kind of jingle from an advert. 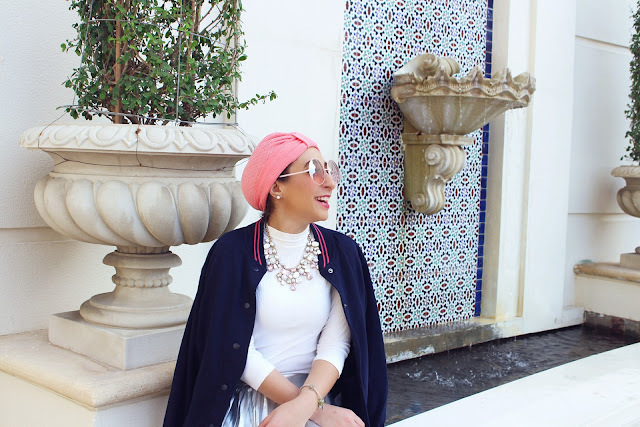 What skincare essential/savoir can’t you live without? The Body Shop Beautifying Oils. I grew up living on oil. It’s good for everything – skin, hair and even cooking! I find it best to use while showering. What are your tips for applying eye liner to achieve that perfect flick? Mark where you would like the flick to end, make sure it’s even on both sides and then follow the line. My makeup artist taught me that! 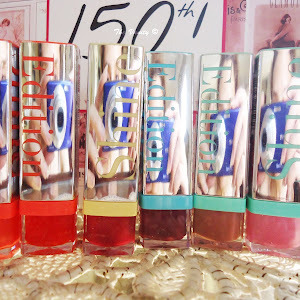 What are your favourite lip, cheek and eye shades? For lips, I like a pink/peach tone as I feel it compliments my skin tone. For cheeks, I love a nice pinky blush and for eyes, I love subtle brown/gold tones. I like scents that are natural and fresh so right now it’s The Body Shop White Musk Libertine, which features in my cruelty-free Collection.